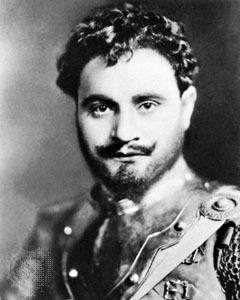 Few other tenors have enjoyed a success equal to that of Italian tenor Beniamino Gigli, considered the only, true successor of legendary Enrico Caruso. Gigli was born some 17 years later than Caruso, on 20 March 1890 in the small Italian township of Recanati near Ancona on the Adriatic coast. He showed a strong inclination for singing at an early age and was admitted to the local cathedral choir before he was 7. The maestro was Quirino Lazzarini, the cathedral organist and the first to give instructions the coming tenor, but he was also taught by Giuseppe Guzzini, the priest of the local cathedral. His first experience on stage came at the age of 17, still a boy, he played the role of the heroine in a student production of the operetta La fuga di Angelica on 28 April 1907 in the provincial capital, Macerata. He was refused admittance to the Schola Cantorum in Rome either on grounds of insufficient education or of age; Gigli was 17 and the age limit was 15. It led him to undertake serious studies with Maestro De Stefani, Maestro De Martino and Agnese Bonucci in Rome, and in 1911, at the age of 21, he earned a scholarship of 60 Lire a month to study at the Accademia di Santa Cecilia (then Liceo Musicale) in Rome, where he received tuition by Antonio Cotogni, the renowned teacher and veteran baritone, and subsequently by the reputed vocal teacher Enrico Rosati. Of a family of poor means, he worked alongside his studies, first in a pharmacy, then as a domestic servant. A music loving colonel made sure he served his military duty in Rome so as to not suffer interruptions in his studies. Then his lucky call came with the international singing contest in Parma in 1914. There were 105 singers of all categories and Gigli came first. In the jury was the legendary tenor Alessandro Bonci, and in the wake of Caruso’s exile from Italy (he was singing almost exclusively for the Met in the US), Bonci wrote in the jury report: “Abbiamo finalmente trovato il tenore!” meaning: At last we have found the tenor. And so it seemed to the public of Rovigo on 15th October 1914, when Gigli made his professional debut in a lead as Enzo in La Gioconda – this was the tenor with whom Italy would redeem the loss of Caruso. He toured Italy and sang in all the important regional theaters: 1914-15 in Genova in Manon and Tosca, Mefistofele in Bologna, Palermo and Napoli (San Carlo) in 1915, Cavalleria Rusticana and La Favorita in Napoli, as well as Lucia Di Lammermoor in Verona and Mefistofele at the Coztansi of Rome, all in 1916, Iris and L’Amico Fritz in Torino in 1917, along with Lodoletta at Livorno and appearances in Barcelona and Madrid in Spain. In 1918 he debuted at La Scala in Mefistofele, invited by maestro Toscanini himself. The occasion was to commemorate Arrigo Boito, who had died that year in Milano. The successes attracted the attention of the major record companies in the world and HMV signed him for an exclusive record deal in 1918, the year in which he also made his first recordings in Milano. Gigli now started to appear outside Italy: During 1919-1921 he sang at Monte Carlo and traveled to South America, where he was successful in performances at the Colón of Buenos Aires and in Sao Paolo, Brazil. At the end of the tour he was approached by the Met director, Giulio Gatti-Casazza, whose desire was to hire Gigli for the Met. He debuted 26 November 1920, one month before Caruso’s very last performance at the Met, and he sang the role of Faust in Mefistofele, which was to become one of his gloss roles. He stayed for 12 consecutive seasons. Initially he must have been intimidated by Caruso’s long and unrivaled reign at the Met, but Gigli rapidly gained popularity and confidence. Upon Caruso’s death in 1921 his mantle was divided between Gigli and Martinelli, Gigli to some extent assuming the lighter, lyric repertory and Martinelli the heavier, dramatic repertory. He was granted the opening night in November 1921 as Alfredo in La Traviata, and it was the first year in 18 consecutive years that Caruso had not been the opening night tenor. With the arrival of Lauri-Volpi in 1923, Gigli had a rival whose repertory much overlapped his, however, Gigli succeeded in maintaining his popularity with the Met opera goers, perhaps through a voice that was more beautiful than both Martinelli’s and Lauri-Volpi’s, and he became the Met’s (and the Worlds’) highest paid tenor. The repertory would include 28 roles in a total of 510 performances, among which was Andrea Chénier, Des Grieux, Roméo, Vasco da Gama (L’Africana), Lionel (in Marta), Fenton (Falstaff), Don Ottavio (Don Giovanni) and Mylio (Le Roi D’Ys). In 1924 he received great acclaim in Berlin in La Bohème, Tosca and Rigoletto, and was a stunning Andrea Chénier at his Covent Garden debut in 1930. Three years earlier, in 1927, he had been granted the honour of singing the tenor part in the Verdi Requiem at the Met on the occasion of the 25th Anniversary of Verdi’s death. In 1928 he participated in the American debut of Puccini’s La Rondine at the Met, and sang in Rigoletto in both Wien and Budapest. In 1931 he was successful as the Duke in London. A dispute over his salary was to be the end of his magnificent career at the Met in 1932. The management was reducing salaries as a result of the economic recession, and the Government radically increased the taxes on income, which led Gigli to quit his contract with the Met in protest and he returned to Italy. For the remaining years of the decade he sang mostly within Italy, with the exception of his great successes in Buenos Aires in 1933, role debuting in La Forza del Destino, the Salzburg Festival in 1936, a full season in London in 1938 and his re-encounter with the Met public the 1938-39 season for one performance of Lucia di Lammermoor, 3 performances of Aida and one performance of Rigoletto. In Italy he became affiliated with the Fascist movement under Mussolini. “Il Duce” much admired Gigli and reportedly he became the the Dictator’s favorite tenor during the 30’s. He openly declared his sympathy for the Fascist Regime and when the Germans occupied the north of Italy, he appeared under their aegis. In Italy he recorded a vast number of recordings, also complete operas and he ventured into the world of cinema. He was a popular tenor, but his sympathy with the Nazi occupants did not go well with his compatriots and when hostilities ended the people turned against him and accused him of being the “Tenor of the Regime.” The authorities forbade him to sing in fear of incidents. Nonetheless, Italy forgave and forgot, and already in March 1945 he did reappear on the stage in Rome, singing in Tosca and Forza. In 1946 he returned to London and Covent Garden for La Bohème opposite his daughter, Rina, as Mimi, and enjoyed great acclaim in Lisboa and Buenos Aires in 1948, and performed in La Traviata in Johannesburg, South Africa, in 1951. His last performance in an opera house took place in Rome 1953, in Fedora, and the very last opera performance took place in Messina, Italy, on 22 August 1954, when he performed in the double bill Cavalleria Rusticana – Pagliacci, for the 40th time in his career on one and the same night. The Americans, still remembering the war, did not see him until 1955, at the end of his farewell concert tour of 41 performances world wide, ending with his last recital in Washington on 25 May 1955. Gigli passed away in Rome on 30 November 1957, at the age of 67, after having suffered a heart attack, as a result of myocarditis (heart inflammation), diabetes and Asiatic flu. Undoubtedly 41 concerts in 4 ½ months at the age of 65 and evenings where he had sung as much 34 pieces, had taken its toll. His career had lasted for 41 years, during which he had recorded more than 400 records, starred in nearly 20 films and sung in 62 roles, counting 2249 opera performances. He was a great Puccini tenor and comfortable in the verismo repertory, but he early ventured into the heavier tenor repertory and sang Verdi roles, perhaps as a result of his obvious artistic competition with tenor Giacomo Lauri-Volpi. He had originally a lyric tenor voice with spinto qualities and with a round, velvety timbre, often referred to as honeyed. His advocates speak of the most beautiful tenor voice heard with an exquisite use of mezza-voce. His detractors disliked him for the excessive use of sobs, aspirations and sentimentality. Apart from the large number of operas and recordings, Gigli also gave 1300 concerts and some 1000 benefit concerts. He did more than any tenor of his day in popularizing opera and his avowed ambition of being regarded as the “The People’s Singer,” a label, received in his home country during the the 30’s, he undoubtedly fulfilled.